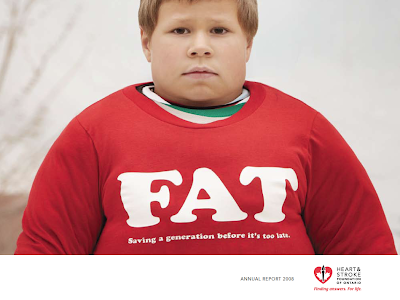 "FAT - Saving a generation before it's too late"
The report received tremendous press and rightly points out that in the past 10 years we've done an absolutely miserable job of stemming the tide of childhood obesity and it's full of pictures of obese children wearing T-shirts with scary facts. The accompanying press release then spews statistics about how kids these days eat even less fruits and vegetables than they did in the 90s, and in general eat far less fresh food. So Freedhoff, where's the hypocrisy? Isn't it true that obesity rates are rising and that kids don't eat well? Sure it's true, but the Heart and Stroke Foundation itself discourages the consumption of fresh, healthy food. You heard me - the Heart and Stroke Foundation discourages the consumption of fresh healthy food because the Heart and Stroke Foundation effectively discourages cooking. By promoting consumption of boxed foods by adorning them with a health halo that lets you feel good you're not bothering to cook. And who do they sell their logo to that scores at most 5 (and usually only 3 or 4) nutritional criteria? Oh, and guess what, Health Check's nutritional criteria, even though in 2006 the Heart and Stroke Foundation identified childhood obesity as "a critical issue for the future health of Ontario" and even though they've just published and promoted their scary report on how your kids aren't going to live as long as you because they're so obese, their nutritional criteria don't include calories. So what types of foods get the Health Check logo? Health Checked boxed, highly processed, not fresh, lowest common denominator, white flour, salty, sugar sweetened, too busy or lazy to cook for their family, types of foods. 188 different Health Checked fruit juices with not one warning or proviso that states that medical organizations the world over recommend a 1/2 cup daily juice maximum for young children and 1 cup daily maximum for older ones. Health Checked beef in all shapes and sizes despite its clear cut link to cancer and with no mention or warning regarding the Canadian Cancer Society's recommendation of a 255gram weekly beef maximum. Health Checked processed meats despite the World Cancer Research Fund and the Canadian Cancer Society's warnings that there is virtually no safe amount of processed meat one can consume and therefore it should be limited to, "special occasions, such as ham for a holiday dinner or a hot dog at a sporting event". Health Checked French fries, Fruit Roll Ups, Dole Squish'Ems (see tomorrow's blog), canned fruit and apple sauces - and if you're looking for fresh fruit with Health Checks you'd better get ready to look hard because of the 531 current fruit or vegetable products with Health Checks only 11% are for fresh fruits or vegetables. Oh, and in case you didn't notice the Health Check logos on your kids' foods, your kids sure will as Health Check still happily allows for co-advertising with Disney cartoon characters - a kid targeted advertising practice maligned and vilified by everyone who cares about children's health and nutrition. Why drink a healthy beverage when you can get a Health Checked Slushie or sugar-sweetened Buzz Lightyear "milk buddy"? Health Check is a healthy eating abomination - it discourages healthy eating, fails to guide Canadians to truly healthy choices, by its nature regularly steers consumers away from even healthier options (if they don't pay, they don't play so if there's a healthier option on the shelf that didn't cough up to the Heart and Stroke Foundation, unless you're a back of label reader you're going to miss it), encourages people not to cook, and still allows for tremendous amounts of even the few criteria they monitor (is there a particular reason why Health Checks are awarded to 17% fat ground beef when 10% extra lean exists or why tomato juices are allowed to provide 480mg or 1/3 of your total daily HSF sodium allotment in 1 cup?). If the Heart and Stroke Foundation and its spokespeople were actually sincere in their desire to help our swelling children they'd put an end to Health Check tomorrow and instead focus their significant amounts of time, energy and clout into promoting the importance of decreasing juice and calories, not skipping any meals and snacks, proper exercise nutrition, loudly promoting school cafeteria reform, discouraging the consumption of processed foods and teaching kids and their parents how to actually cook. Fat chance there though as Health Check generates millions of dollars for the Heart and Stroke Foundation and despite it's glaring, unforgivable, pathetic shortcomings, they're still actively promoting and expanding it - and in so doing harming the health of Canadian children and guiling parents into thinking that boxed food is nutritious and that cooking fresh, healthy meals isn't necessary. And really, it's not as if they don't understand just how grave the situation is. Here's a collection of all of their annual reports' t-shirts. "My parents may live longer than I will"
"28% of kids in Ontario are overweight or obese. And it's not their fault"
"I've got 3 times greater risk of high blood pressure than kids 20 years ago"
"My parents care more about my grades than heart disease"
"If I stop obesity can I keep the $1.8 billion saved in healthcare?" "Only 1 out of 10 kids is fit"
"9 out of 10 kids parents THINK their kids are fit"
"Inactivity makes me decades older"
"Too much screen time is GAME OVER for my health"
"Healthy food feeds my whole body"
"Build me a sidewalk and I'll walk to school"
"My Cafeteria needs an urgent Health Check"
"We should all get in the game"
"Healthy living is smart. Just check my grades." "Let the TV eat by itself. I'm better off eating with my family"
"Race ya to the park and back"
"Eat well. Get active. Live longer"
"I have the right to grow up healthy"
We deserve better and the Heart and Stroke Foundation's advisers and health professionals know it and so do nutritional professionals the country over - they're just too scared to say anything because the Heart and Stroke Foundation's reach is tremendous. Heart and Stroke Foundation representatives sit on boards of directors of NGOs, provide grants, fund research and help shape Canadian health policy. Perhaps that's why in frank and candid off the record discussions with me I've found academic researchers and nutritional professionals to be uniformly terrified of biting the hand that feeds them despite behind closed doors agreeing that Health Check is awful and likely does more harm than good. Too bad too because the hand that hand feeds them offers metabolic syndrome promoting, obesity inducing, diabetes promoting, blood pressure raising, cancer causing, crap. Advocacy via the public or via industry? Artificial sweeteners help keep it off. Jamie Oliver - the video game? Badvertising: Mott's Fruitsations miracle sauce. Hydroxycut - a case study in scumbaggedness. Frankenfood - Deep Fried Butter! Do you really want to send that meal back? World's most affordable treadmill desk! World's Stupidest Childhood Obesity Tie-in?